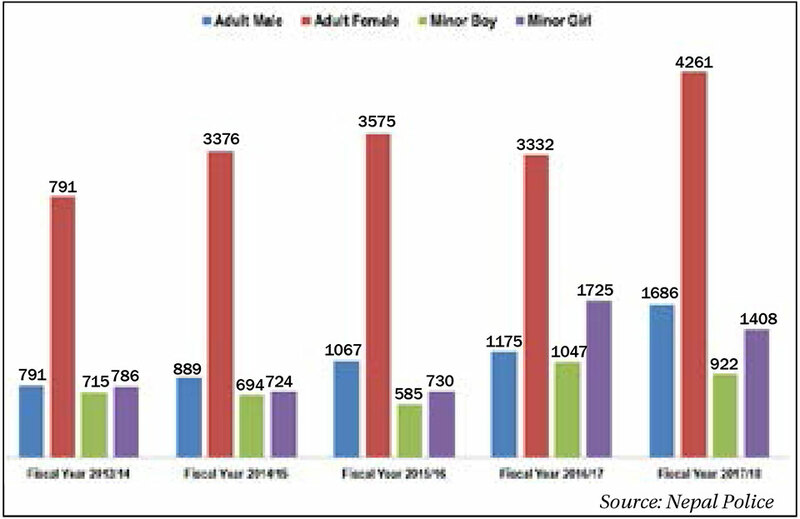 Kathmandu: Data maintained by Nepal Police show that around 83 percent of the people who went missing in the last five years were either women or children. A total of 32,364 missing complaints were filed across the nation in the last five years. Out of the total complaints, 26,756 complaints accounted for missing children or women. Even in the last fiscal year, about 80 percent of the people who went missing were either women or children. Although the government, police, and various organizations are running different programs to minimize the disappearance of women and children, 21,564 women or children missing during the review period are still unaccounted for. This is also because the family members file missing cases but do not inform the authorities after the missing person comes into contact, according to sources at the Police Headquarters. Police officials claim that the reason behind the large number of disappeared persons being women or children is that the sensitive family members often file missing cases in haste without properly verifying if they are actually lost. According to SSP Uttam Raj Subedi, spokesperson of Nepal Police, family members often file missing complaints in cases related to children even if the children get out of sight. “Most of the disappeared children do not actually go missing, but are just separated in crowds and the parents out of desperation tend to register missing complaints without even searching for their children,” he said. He added that the reason behind the increasing number of disappearance of women is the lack of communication with their family members. The number of missing complaints registered at various police stations across the nation has seen a steady rise in the last five years. A total of 8,277 missing complaints were registered across Nepal in Fiscal Year 2017/18, which is an increase of 14 percent as compared to the preceding fiscal year’s tally of 7,279. As many as 5,957 missing complaints were filed in the Fiscal Year 2015/16 while 5,683 complaints were registered in Fiscal Year 2014/15. The data on the disappeared persons also show that about 80 percent of the people who went missing in the last five years are yet to be found. Of the 32,364 missing complaints filed in the review period, only 6,268 were reported to be found. In paper, the whereabouts of 26,096 people still remain unknown. However, SSP Subedi said that the reason behind such a large number of people still missing is that the family members report the missing complaints but they do not inform the police after they are traced. “People don’t inform the police when the disappeared persons are found because of which the data becomes misleading,” he said.